The group is working on the chemical design of novel functional materials for applications in electronics, photonics, sensors and energy storage. Such materials include graphene, carbon nanotubes, inorganic nanowires, colloidal particles, macroporous oxides and some others (Figure 1). Our strategy is to control the structure and composition of these materials at nanoscale to define their properties. Figure 1. SEM images of different micro- and nanostructured materials with interesting properties. (a) A fragment of a monolayer graphene stripe with periodic holes. Scale bar is 1 μm. (b,c) Periodic silicon nanopillars. Scale bars are 500 nm. (d) Colloidal crystal composed by monodisperse polystyrene microspheres. Scale bar is 1 μm. (e) Side view image of a macroporous titania film. Scale bar is 2 μm. One of the examples includes graphene-based nanostructures, such as nanoribbons and nanomeshes. Graphene, a two-dimensional material composed of carbon atoms packed in a honeycomb lattice, is attracting enormous interest due to its remarkable electronic, mechanical and thermal properties. Graphene has a great potential for electronics, but it cannot be directly used as a replacement for silicon in logic applications, because it has no bandgap. However, the bandgap can be opened if graphene is carved into nanostructures such as nanoribbons or nanomeshes (Figure 1a) with feature sizes less than 10 nm, which enables making graphene-based field-effect transistors with high on-off ratios. This is a vivid example of how controlling material’s structure at nanoscale defines its physical properties. Another example is based on the self-assembly of monodisperse colloidal particles to form 2D and 3D arrays. When the structure of such an array is well-controlled, it gains a new property, the strong diffraction of light of certain wavelengths (Figure 1d). Such highly ordered assemblies of colloidal particles are known as colloidal crystals, and they are expected to find applications in optical technologies. P. Wilson, A. Zobel, A. Lipatov, E. Schubert, T. Hofmann, and A. Sinitskii. 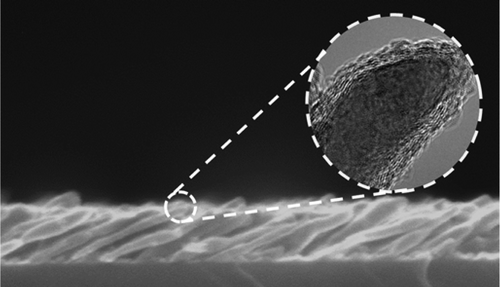 Multilayer Graphitic Coatings for Thermal Stabilization of Metallic Nanostructures. ACS applied materials & interfaces (2015) ASAP . P. M. Wilson, G. N. Mbah, T. G. Smith,a D. Schmidt, R. Y. Lai, T. Hofmann and A. Sinitskii. 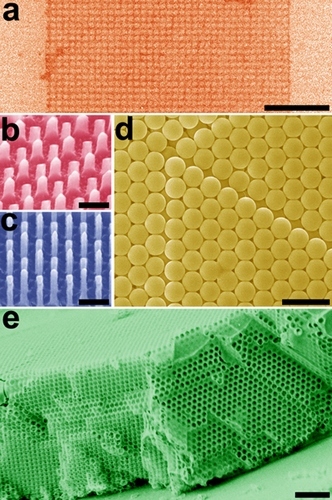 Three-dimensional periodic graphene nanostructures. J. Mater. Chem. C 2 (2014) 1879.